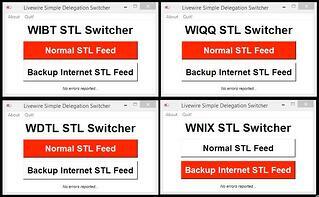 He calls it the "Livewire Simple Delegation Switcher." Anthony is making the app available for free, and has already published a couple of updates with new features. Read about it and download the app here. I recently imagined, then "realized" a backup STL system for my big FM transmitter site in Mississippi. We have 3 FM stations there, all fed by Livewire over a 13-mile IP-Radio link (here's a white paper I wrote about that when we installed it). Even though the IP-Radio link is amazing, we had no backup STL in case of a failure. Just recently we got Public Internet to this very rural site via a Wireless ISP. I built a PC to receive our stations' Public Internet streams, then convert them to AoIP streams. For various technical reasons, it turned out that I needed my local AoIP streams to be AES67 SIP Unicast. Livewire streams wouldn't work as well in this particular case. Great news! Our new Axia IP-Audio driver has AES67, including SIP Unicast! Now I could (manually, with lots of typing) switch my transmitter feeds to a backup source by entering new subscription addresses in the Destinations section of our xNode. 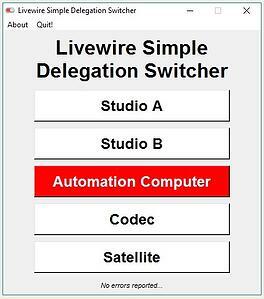 We recently learned of Anthony Eden's Livewire Simple Delegation Switcher program. Using this program I have buttons that are programmed to do this route switching, if and when needed, saving a lot of typing in an off-air situation. I made a techno-geeky video about this. Those already familiar with Axia will understand it right away. Still, I hope all engineers are inspired to see technically modern yet simple and reliable solutions if they have AoIP available. This solution is possible because of the flexibility of Livewire+ and AES67.